USB extension coil cable; A male to A female cable. This coiled cable is great solution to keep your desk tidy. Ideal for extending your existing USB Cable. 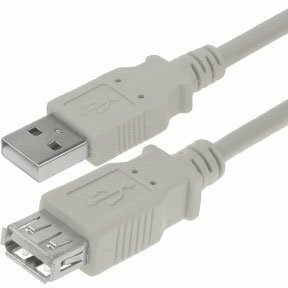 USB A Male to A Female cables are used to extend existing USB connections. The extension cables are available in straight, coiled, or panel mount for flush or hidden USB ports. There are passive or active cables that ensure that signal and power is properly sent. We have A Male to A Female cable with panel mount in various lengths, USB 2.0 extension coil cables, and many other products that can help you extend your USB connections.